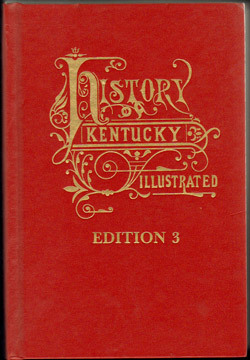 This book was originally published in 1887 as The History of Kentucky, Edition 3 by F. A. Battey Publishing Company. The authors are: J. H. Battle, W. H. Perrin, and G. C. Kniffen. A total of nine editions or book volumes were published of The History of Kentucky, each covering a completely separate group of counties. Each book volume was titled by the publisher as an edition rather than by volume number. As a result, each volume is entirely different but are titled as edition 1, edition 2, edition 3 rather than as volume 1, volume 2, or volume 3, etc. Hardbound, 543 pages plus a lengthy, detailed index exclusive to this reprint edition. Note: We also offer this same book in searchable PDF format on our History of Kentucky, Edition Three CD. See the History of Kentucky, Edition Three CD for a complete description including a full list of the biographies that are included in this book.